Guadalest - A 'must see' place to visit whether staying locally or down in Benidorm. The surrounding area, is very popular for hiking, cycling and fishing. The apartments have a rustic-style décor with exposed stone walls and beamed ceilings. Each one includes a lounge area with a fireplace, sofas and a TV, as well as a kitchen equipped with a microwave, oven and washing machine. Guadalest Reservoir is a 15-minute drive from El Molinet del Governador house and there are many areas to go hiking nearby. The coastal town of Altea and its beaches are 12 km away, and Benidorm is around 15 km from the house. 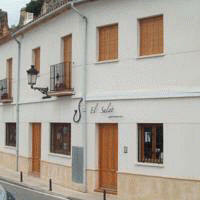 All apartments at Alojamientos Rurales Aitana have 1 double and 1 twin bedroom. The bathroom with shower includes toiletries and a hairdryer, and there is a TV in the spacious living-dining room. The fully-equipped kitchenette has a breakfast bar and includes a washing machine. There are shops, cafés and restaurants in Guadalest, and there is a drinks vending machine on site. Guests can enjoy a wide range of outdoor activities in the surrounding area, including hiking, cycling or fishing. 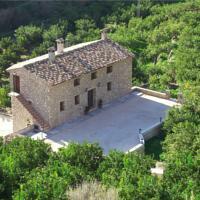 La Font Roja and la Serra de Mariola Nature Reserve can be reached in about 35 minutes by car. Benidorm is 25 minutes’ drive from Alojamientos Rurales Aitana. Denia Ferry Terminal with regular crossings to Palma de Mallorca, Sant Antoni de Portmany and Formentera is 60 km away. Each air-conditioned apartment has a living room with a sofa and TV. They are also heated and have a private bathroom and well-equipped kitchenette with a fridge and microwave. Apartamentos Rurales Venta El Salat have a tour desk. You can go horse riding, hiking and cycling in the surrounding area. 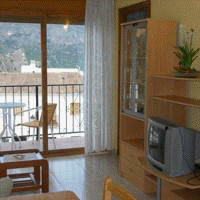 The village offers wonderful views over the valley and the Mediterranean Sea. One of the most picturesque 'must see' places to visit when holidaying in Benidorm has to be Guadalest. Located around 600 metres above sea level in the mountains it is the most visited village in the whole of Spain - and once there you can understand why. Don't worry if you are here on an all-inclusive package with no car: Get the bus! The No.16 goes from the centre of Benidorm every day. The journey time from the triangle is around 1 hour and 10 minutes - not bad considering it's about 50Km away, arriving in Guadalest at approximately 11am. The return bus departs at 1.30pm, giving you a good two hours in Guadalest - which to be honest is ample. My only advice is don't go on a Tuesday as Altea market is on and the journey will be incredibly slow up till then. Once in Guadalest, you can stop at one of the numerous cafes or bars for refreshments - there is even an English tea room serving an all day English fry-up! As you approach the 'citadel' there is the obligatory photographer taking pictures of your group - available as a framed print or printed onto a key ring. These are both ready for when you walk back down ......a bit like snappy snaps! They are not at all pushy so don't feel obliged to purchase. There are four 'museums' to visit and many gift shops selling souvenirs which are a delight to browse through.....everyone leaves with a little something - me just a few more 'somethings' than my husband wanted! .....And finally you get to the breath-taking cliff edge and get to look down at the reservoir - which is the most amazing turquoise colour. This reservoir supplies drinking water to Benidorm and the surrounding areas. When there are forest fires nearby the fire brigade water planes skim over the reservoir to scoop up water to put out the flames! It really is a picture opportunity as you can see. An enjoyable half day out and a total change from the hustle and bustle of Benidorm - definitely a trip I would recommend.